Homemade gifts crafted with love are always appreciated and always warm the heart during the holidays. But if you're like me, you have a very long list, and are very short on time. With that in mind, we've put together some super easy gifts that evoke that homespun feeling - only requiring a container, ribbon and tag from our Gift Wrap Wonderland and a great recipe. 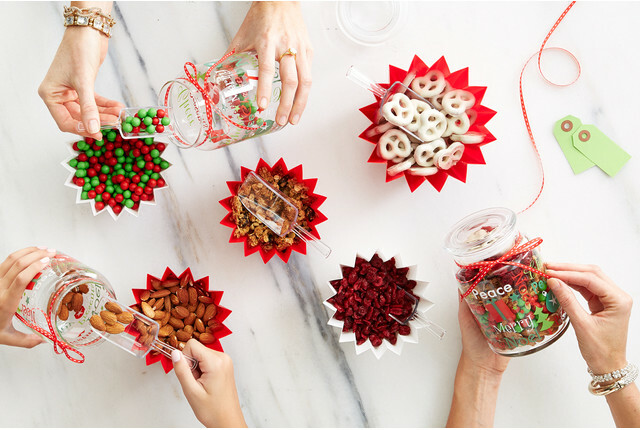 Teachers, co-workers, family and friends will love these DIY Christmas gifts that are packaged with TLC and tasty treats. And here's the deal - we won't put you on the naughty list if you skip the recipes and use store bought items - fun packaging says "I made this!" Let the nuts cool completely. Mix the nuts with the dried fruits. Heat oven to 375°F. Spray large roasting pan with non-stick cooking spray. Combine corn snacks, cereal, pretzels and pecans in prepared pan; set aside. Combine brown sugar, butter, corn syrup and salt in 2-quart heavy saucepan. Cook over medium heat, stirring occasionally, until mixture comes to a full boil. Remove from heat; stir in vanilla and baking soda. Pour syrup mixture over cereal mixture in pan; toss to coat. Bake 15 minutes, stirring every 5 minutes, or until coating is set. Remove from oven; stir. Spread mixture onto waxed paper. Cool 5 minutes; stir in chocolate pieces. Cool completely; break into pieces. Store in container with tight-fitting lid for up to 1 week. Line cookie sheet with foil or waxed paper. In medium microwavable bowl, microwave white chocolate on High for 1 minute, stirring once halfway through microwaving, until melted. If necessary, continue to microwave on High in 15-second increments, stirring until smooth. In another medium microwavable bowl, microwave semisweet chocolate on High for 1 minute, stirring once halfway through microwaving, until melted. If necessary, continue to microwave on High in 15-second increments, stirring until smooth. Stir 1/4 cup of the hazelnuts into each bowl of chocolate. Alternately, spoon white mixture and brown mixture in rows, side by side, onto cookie sheet; spread evenly to about 1/4-inch thickness. With knife or small metal spatula, cut through both mixtures to swirl for marbled design. Refrigerate until firm, about 1 hour. Break into pieces. Wash the oranges and lemon thoroughly. Cut the oranges into 1/8-inch slices using a mandolin, removing the seeds as you go. Stack the orange slices and cut them into quarters. Place the oranges into an 8-quart stainless steel pot. Add the lemon zest, juice and the water to the pot, set over high heat and bring to a boil, approximately 10 minutes. Once boiling, reduce the heat to maintain a simmer and cook, stirring frequently, for 40 minutes or until the fruit is very soft. While the fruit is cooking, fill a large pot (at least 12-quarts) 3/4 full with water, set over high heat and bring to a boil. Place 10 (8-ounce) jars and rings, canning funnel, ladle, and tongs into the boiling water and make sure the water covers the jars by at least an inch. Boil for 10 minutes. Turn off the heat, add the lids and leave everything in the pot until the marmalade is ready. Meanwhile, place a small plate in the freezer. Increase the heat under the orange mixture to return to full boil. Add the sugar and stir the mixture continually, until it reaches 222°F to 223°F on a deep-fry or candy thermometer, and darkens in color, approximately 15 to 20 minutes. You may need to adjust the heat in order to prevent it from boiling over. Test the readiness of the marmalade by placing a teaspoon of the mixture onto the chilled plate and allowing it to sit for 30 seconds. Tilt the plate. The mixture should be a soft gel that moves slightly. If mixture is thin and runs easily, it is not ready. Preheat oven to 300° F. Line one large baking sheet with parchment paper or a silicone-baking mat. Toss the oats, almonds, cashews, and cinnamon in a large bowl. Set aside. In a medium heatproof bowl, microwave the maple syrup, coconut oil, and almond butter together for about 30 seconds. Alternatively, you may melt these ingredients together in a small pan on the stovetop. Remove from the microwave and using a fork or rubber spatula, stir until everything is melted together and smooth. You may need to microwave it for 10 more seconds or so. Allow to cool down for about 5 minutes (you don't want to cook the egg white!). Once slightly cooled, whisk in the egg white and vanilla. Pour over the oats and toss to coat. Make sure all of the oats are moistened. Spread onto the prepared baking sheet (it usually always fits onto just one - if too crowded, use two baking sheets and bake at the same time on different racks) and bake for 45 minutes, stirring every 15 minutes. Remove from the oven and allow the granola to cool completely - the air will help the granola obtain a crunchy texture. Once cooled, toss in the dried cranberries, raisins and chocolate chips. Make-ahead tip: Granola remains fresh in an airtight container at room temperature for up to 3 weeks. Heat water in a saucepan over medium-low heat; cook and stir white sugar into hot water until dissolved, about 5 minutes. Stir brown sugar and salt into the sugar mixture until dissolved; stir in butter. Whisk eggs and vanilla together in a bowl until smooth; stir 2 to 3 tablespoons hot sugar mixture into eggs, 1 tablespoon at a time, to slowly bring eggs up to temperature without cooking them. Slowly stir egg mixture into saucepan with sugar mixture. Fold in pecans. Increase temperature to medium heat; cook and stir mixture until thickened and bubbling, about 5 minutes. Reduce heat to low before serving. Remove several ounces of vodka to make room for other ingredients in the bottle. Add berries and basil to vodka. Seal bottle and gently shake to mix ingredients. Let sit for 2-3 days. Liquid will "steal" the color from the berries and turn pink, while the berries fade. Strain vodka into another bottle and discard other ingredients. Melt the white chocolate in the microwave at half-power. Once it's melted, add the canola oil until you get a thin enough consistency for dipping your pretzels (how much you use will depend on the chocolate that you use - you may need more than 1/4 cup.) You can also melt the chocolate in a double boiler. Place a pretzel on a fork and dip it into the white chocolate. Tap the excess chocolate off and slide the pretzel off of the fork onto a parchment or wax paper-lined tray. If you'd like to do colored stripes just mix a few drops of food coloring (make sure it doesn't contain water!) into a small amount of the melted chocolate. Transfer the mixture to small plastic bag or a piping bag, and cut a very small hole in the corner of the bag, or use a very small piping tip. Once the white chocolate on the pretzels has set, drizzle the colored chocolate over the pretzels. Alternatively, you could top these with crushed candy cane pieces or vegan decorating sugar. Dump the dough onto a well-floured surface to knead it into a ball. Flour your hands and a rolling pin, and roll the dough 3/4-inch thick. You should see small bits of butter in the dough. Keep moving the dough on the floured board so it doesn't stick. Flour a 3-inch round plain or fluted cutter and cut circles of dough. Place the scones on a baking pan lined with parchment paper. Collect the scraps neatly, roll them out, and cut more circles. Sift flour, soda, salt and spices together in a medium bowl and set aside. Using a mixer, cream butter and sugar until light and fluffy. Add egg and mix until combined. Add molasses and mix until combined. Gradually add in flour mixture and mix until combined and dough forms. Divide dough into four sections and shape each into a flattened disc. Wrap each disc in plastic wrap and refrigerate for several hours or overnight. When ready to bake preheat oven to 350°F. Roll out each disc between two sheets of parchment paper using a rolling pin. Flour the sides of the paper that will touch the dough to make it a little easier to release. Cut out shapes and remove excess dough to reuse. Leave cutouts on parchment paper and transfer to cookie sheet. Bake for 8-9 minutes. Cool on cooling rack. For the icing, mix together four cups confectioner's sugar and four tablespoons meringue powder with about four tablespoons water. If it's too thick, add more water a teaspoon at a time. Or if it's too thin, add more confectioners' sugar. Decorate using a #2 to outline and #3 tip to fill in. Pop popcorn in a popcorn popper into a large bowl (or alternately in the microwave if using microwave bags of popcorn) according to manufactures directions. Remove any un-popped popcorn kernels. Toss in broken pretzel pieces and M&Ms. Melt Vanilla Candy Melts in a microwave safe bowl on half-power in 30-second intervals, stirring after each interval until melted and smooth. Drizzle half of the melted chips over popcorn mixture, then stir, tossing gently a few times with a rubber spatula. Then drizzle remaining half of melted chips over popcorn, and gently stir mixture until evenly coated (don't over-stir though, or your sprinkles won't stick if the white chips begin to set and harden). Pour mixture into a single layer onto wax paper. Sprinkle entire mixture evenly with sprinkles (as many as you'd like) before vanilla chips set. Allow to cool and harden, then gently break into pieces and store in an airtight container. You can fill 8 - 9 1/2"x 4" party treat bags about 2/3 full with this recipe. Biscotti This is a quick and simple, no frills biscotti. But you can always head to your favorite bakery and package the store-bought biscotti in a cute way. Preheat the oven to 375°F. Grease cookie sheets or line with parchment paper. In a medium bowl, beat together the oil, eggs, sugar and anise flavoring until well blended. Combine the flour and baking powder, stir into the egg mixture to form a heavy dough. Divide dough into two pieces. Form each piece into a roll as long as your cookie sheet. Place roll onto the prepared cookie sheet, and press down to 1/2 inch thickness.